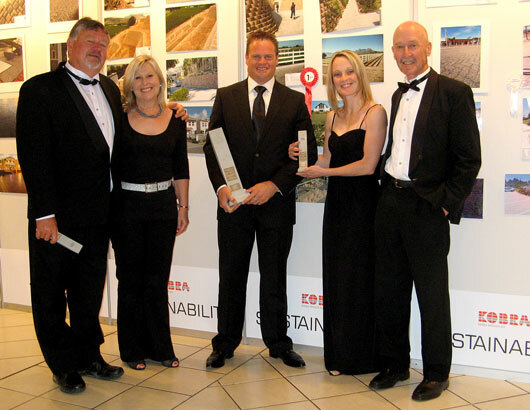 Cape Retaining Systems wins Trophy at the 2012 CMA awards! Cape Retaining Systems was started 10 years ago as the marketing arm of Klapmuts Concrete. Klapmuts Concrete and Cape Retaining Systems have obtained the various licenses for marketing numerous retaining wall products such as Terraforce, Loffelstein and Infraset range of products like the Water Loffel and Terrace Blok. This give the public and contractors a large range of retaining products to choose from. The technical staff from CRS can advise the customer what is the most economical retaining block as well as the best suited retaining blocks for specific retaining problems. CRS offers services of selected approved retaining wall contractors for professional quotations and installations of retaining blocks. All the recommended contractors have a minimum of ten years experience in the retaining wall field. CRS can also offer the services of advising the client the best preliminary / cost effective wall design at no cost. Once the most effective design is obtained CRS would recommend an approved engineer to carry out the design of retaining wall on your site for submission to local Municipality, the cost of this work could be for the client. For more info please contact us, we will be happy to answer any questions you might have.